The Miami Heat will put nicknames on the back of their jerseys for select regular-season games over the next few months, and Ray Allen is bringing back a classic movie character for his jersey. New York-based actor and filmmaker Spike Lee has unveiled the first photo of Allen’s "Jesus Shuttlesworth" jersey from the popular sports movie "He Got Game." Allen co-starred in the film with Denzel Washington, playing Washington’s son (Jesus Shuttlesworth), a blue-chip recruit facing the temptations of agents and college coaches in his final year of high school. The file was written and directed by Lee and hit theaters in 1998. Heat players will reportedly wear nickname jerseys in four games this season, including the Jan. 21 matchup against the Boston Celtics in Miami. 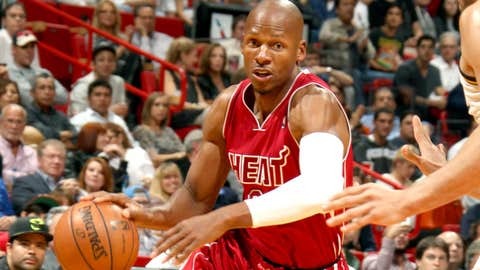 Check out the J. Shuttlesworth home jersey in the photo below.